The Tulane Green Wave is coming to Columbus on Saturday to face Ohio State (for this first time ever) and Urban Meyer at 3:30pm in Ohio Stadium. Tulane isn’t a good football team, with a 1-2 record and their only win against a Championship Subdivision Nicholls State. It will be a good game to get a lot of repetitions for the younger Buckeyes, and for fans to see the future of Buckeye football. Ohio State faces Penn State next weekend in Happy Valley and might be looking past Tulane, but it probably won’t make a difference. Covering a 37 point spread is the only thing that might be hard. Urban Meyer returns to the sideline this weekend after a serving a 3 game suspension. Meyer is looking forward to returning and shows no signs of being discouraged by the actions taken by the university. Ohio State’s best defensive lineman, Nick Bosa, ironically, will be sidelined with a core muscle injury that required surgery this week. His time out is undetermined. Ohio State has looked really good so far this season with the biggest test coming on the road last week in a 40-28 win against TCU in Arlington Texas. Ryan Day returns to his role on the team after serving 3 games as the acting head coach. He will go back to calling plays for one of the most prolific offenses in the country this year (608 yard per game and 56 points). Meyer wants to be a game manager leaving the play calling to Day and Kevin Wilson. Meyer might be able to help the defense more that the offense as Ohio State has allowed teams to make big plays against it so far this year. 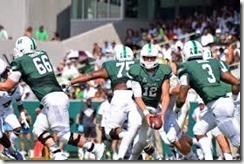 Tulane, a member of the American Athletic Conference, is led by quarterback Jonathan Banks, a big arm athletic quarterback that can hurt you in a number of ways. His biggest issue so far this year has been a lack of accuracy. Texas Tech transfer running back Corey Dauphine has the speed to gash defenses for big gains and will try to do so on Saturday. Experienced receivers Darnell Mooney and Terren Encalade might be a challenge for the younger Ohio State secondary. Dwayne Haskins, red-shirted sophomore, passed for 344 yards last week against the Horned Frogs, a personal best. He is on pace to beat Joe Germain’s season record of 3300 yards. KJ Hill and Parris Campbell both had big games last weekend and could see some early plays against the Green Wave. Ohio Stadium (the Horse Show) is your first option. But then there’s the Big Ten Network. Or listen on Buckeye Radio like 97.1 FM in Columbus.